Playing race cars is fun but it's even better if you’ve built the car yourself. You don’t even need a kit as long as you have recyclables and a few common household items. Let your child come up with his own design, or maybe even several, and see which one works best. The base of the race car needs to be slightly wider than the plastic bottle. Mark the bottle’s dimensions on the cardboard. Have your child draw his base around this – he can get as creative as he wants. Now trim two straws to the width of this base and tape them to the underside. These hold the axles in place so space them accordingly. 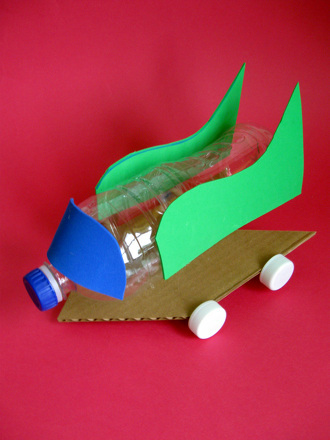 Help your child hot glue the bottle to the top of the race car base. He can decorate the bottle with paint, markers, stickers or cardboard cut-outs. Roll up a marble-sized ball of modeling clay. Press it inside one of the bottle caps. Repeat this process with each bottle cap. Thread a skewer through one of the straws. Cut the skewer so it is about two inches longer than the straw. If this axle is too short, the wheels won’t turn freely. Press two wheels onto your axle and then repeat this step with the second axle and the second set of wheels. Roll the car base on a flat surface to make sure the wheels turn freely. Race cars roll better down a sloping surface. Set up a large piece of cardboard on several books and let the races begin! 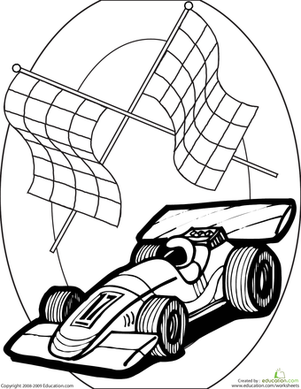 Rev up your child's love of coloring with this fun race car coloring page. This race car coloring page could sure use a paint job! Does your child have her crayons ready? Practise two-digit addition with this race car themed worksheet. Use mental maths to figure out how fast each race car is moving. Have fun reading facts about race horses, unscramble the words related to race horses, and colour in the picture of the horse and jockey! See which snail has gotten the farthest with this year 3 measurement snail race worksheet. 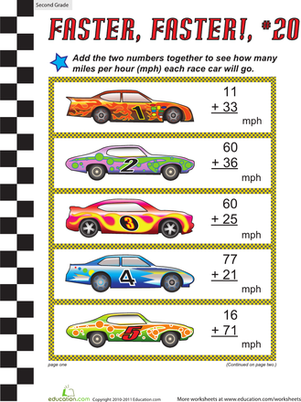 Practise addition with this race car themed maths worksheet. Using mental maths, kids will solve two-digit addition problems to find out which car won the race. Try this two-digit addition worksheet with your race car enthusiast. Using mental maths, kids will solve to find out how fast each race car is going. Kids will solve two-digit addition problems in this fun race car themed worksheet. Use mental maths skills to find out how fast each race car is going. Use mental maths to solve two-digit addition problems in this race car themed worksheet. Kids will solve to find out how fast each race car can go. Solve problems in this two-digit addition worksheet to see how fast each race car is going. This race car themed maths worksheet helps kids practise mental maths. Get your child excited about maths with this race car themed worksheet. Kids will solve two-digit addition problems to find out how fast each race car is moving. 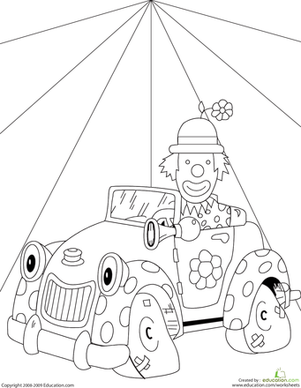 This fun circus coloring page features a clown in a silly clown car under a circus tent.